Raf Anzovin, left, and David Boutilier, with an image they created for an American Canoe Assoc. public service announcement. 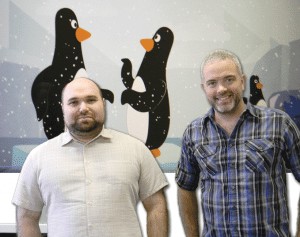 Raf Anzovin, president of Northampton-based Anzovin Studio, has discovered that success in the animation industry comes to those who push their businesses to the edge — the cutting edge of technology. Dedicated to supplying an array of services to clients while regularly improving the tools with which they create their products, the Anzovin Studio staff has mastered an ingenious two-pronged approach. Even when business is thriving, the company challenges itself to refine its practices and streamline its productivity, which serves to benefit both artists and clients. With that truth constantly in mind, Anzovin and his staff strive each year to develop new software that not only benefits Anzovin Studio artists but also draws the interest of clients. One of the studio’s latest and most successful software products, Anzovin Rig Tools, is expected to provide major advances in the area of character rigging. Because Anzovin’s software programmers and artists work in close collaboration, each new plug-in tool and application serves a specific need, with the ultimate goal of making computer-animated characters as seamless and believable as possible. “We’re very excited about it — this particular area of animation hasn’t had significant upgrades since the ’90s,” Anzovin said of the new product, which has not yet been brought to market. If the success of the studio’s previous products is any indication, then Anzovin Rig Tools will be utilized by some of the most prominent players in the industry. In past years, companies like Dreamworks, Disney, and Sony have bought Anzovin’s products, while the studio has consulted with clients like Microsoft, EA, and Hasbro. “There are certain areas like character rigging where we are really pushing the technology,” added Anzovin, who takes pride in spearheading technological advances. In short, he told BusinessWest, companies that fail to keep up with the breakneck speed of invention in this industry find it doesn’t take long to fall behind. In addition to its software-design work, Anzovin Studio produces educational and entertainment content through several media each year. Its art can be seen in everything from commercials to public-service announcements to video games, depending on the client and the request. 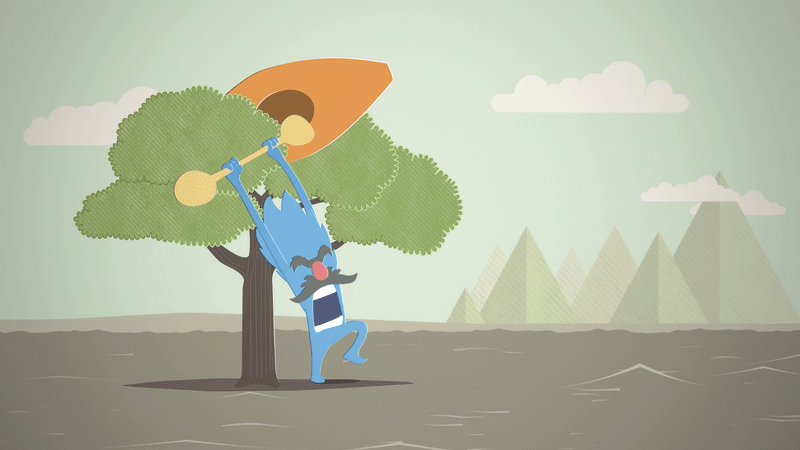 Last year, the studio supplied animation for a PSA run by the American Canoe Assoc., a piece that employed cartoon-like characters to convey water-safety tips in a unique manner. Anzovin said the studio usually produces art for a handful of TV commercials each year, but that number might rise in future years, because the amount of content featuring animation is expected to increase. With the popularity of video sharing and downloading, the Internet is also a source of boundless potential for animators, especially when distributed across social-media platforms. Meanwhile, video games have generated solid business as well, with the studio providing cut-scene animations for such games as Halo II, Charlie and the Chocolate Factory, The Da Vinci Code, The Sims Medieval, and Mercenaries II, among others. “One of the great things about animation is that it can be used as a communication tool but also for entertainment — we often bring those two aspects together in our projects,” Anzovin said. But the staff’s emphasis isn’t always on fun and entertainment when it comes to video games. The studio frequently contributes animations for instructional games and programs designed for individuals preparing to deal with hazardous law-enforcement and military situations. A recently released training program for the Department of Defense, for example, included art created by Anzovin’s staff to help simulate civilian populations in various locations. The tool will help soldiers learn how to defuse potentially dangerous encounters in highly populated areas. “It’s really nice when we can help solve problems and serve social purposes,” added Mazonson, who is excited to be working on a new project with the American Canoe Assoc. — an animated memoir of individuals recounting their stories from the water. The project will be funded by a grant allocated by the U.S. Coast Guard. The concepts and methods that drive computer animation can be a little tricky to understand — if not downright mind-boggling at times — but Mazonson described the complexities of creating character-rigging products in remarkably simple terms. Anzovin believes one of the major keys to successful animation is to become a master of movement. Many movie animators have perfected the art to such a degree that, from a distance, animated characters can often be mistaken for actors. Their movements are swift and natural, seemingly enhanced with each movie. So how long does it take to create such vivid animations? In terms of average project length — from the initial design stages to completion — a variety of factors come into play. Sometimes a project can be finished in just a few weeks, while other endeavors can last up to two years. Above, imagery created by Anzovin Studio for the American Canoe Assoc. Below, animation created for client Squelch Inc.
Raf Anzovin never spent a day in a college classroom, but he wound up teaching collegiate courses. He didn’t attend high school, either. Homeschooled and self-taught in the world of computer animation, he found this industry to be an open road for an 18-year-old going into business with his father. The possibilities offered in this new, exciting, undeveloped terrain were limitless, the perfect career choice for technologically inclined artists like Anzovin whose passion and ambition are matched only by their creativity. After exploring various institutions, Anzovin decided not to attend college because there weren’t many computer-animation programs available. Instead, he went to work with his father, starting off in Amherst and eventually moving into the studio’s current Nonotuck Mill office in 2009. Now, five years after calling the Florence section of Northampton home, the business has become an industry leader in technological innovation, with major companies routinely turning to Anzovin and his staff for consultation. Over the next few years, Anzovin hopes to continue consulting with his studio’s partners and also to build new relationships, preferably with local businesses. As one of the only companies in the region focusing heavily on character animation, most of its clients are based outside Massachusetts, many of them in different time zones. One project that might help raise the studio’s profile will take place in the coming year — a collaboration with representatives from Google. Though Anzovin couldn’t get into much detail about the project, he said it will likely involve mobile devices and the creation of tools. Judging by how far animation has progressed in the last decade, in addition to Anzovin Studio’s commitment to innovation, the company will likely be redefining industry standards for years to come.